Well, it’s a new year. I’ve been learning a lot lately as I continue on my journey toward school administration mastery. Just when I think I’ve got things figured out, however, I run into one of those tough learning lessons that bring me back down to earth. During the last month of 2012, I had to apologize a few times for some mistakes that I made. One was a typo on some handbooks that I created for the school. I omitted a letter in the last name of our principal, so 1100 handbooks were printed with the principal’s last name misspelled. Thankfully, the principal was great about it. She saw it as funny. I didn’t. During the three week Christmas break, I had time contemplate my recent mistakes, and I realized that my problem was a lack of focus. I’m the kind of person who is always trying to make an impact. I think that is a good thing, but lately, it’s been causing me to lose focus on what I really need to be doing. I had been working on a few side projects to help make my job easier and to hopefully improve communication between parents and teachers. A couple of these projects had do to with creating websites for teachers and school administrators. I was working hard to make an impact with these side projects, but I was not concentrating on what I should be doing as part of my position as school administrator. Having these weeks off has allowed me to step back and see things from a different perspective. Now, I’ve made a decision for the coming year: Focus on what is important. 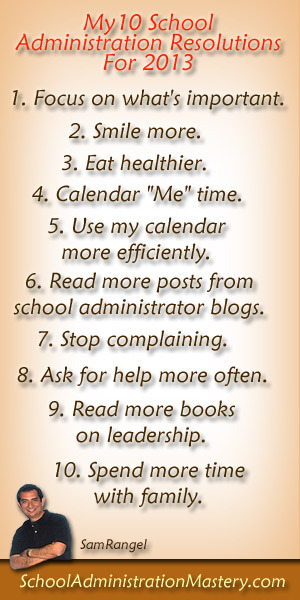 This new year, I’ve come up with a set of 10 resolutions that will help me move toward school administration mastery. 1. Focus on what’s important. I’ve made a list of my responsibilities. I will focus on these first, and then work on side projects. This has always been difficult for me. I have a natural frown, and I need to actually think about smiling. Smiling demonstrates that I am a positive person and that’s the image that I want to portray. Sitting in my office, I find myself munching on candies or other snacks that I know aren’t healthy, and that can’t be good. I have to empty my candy jar and fill it with nuts or granola or something. This is going to be tough. I hate granola. My day gets so busy time that I find myself snapping at students or losing focus. I need to have a scheduled time in my day when I can just take a walk for five or ten minutes to replenish myself. 5. Use my calendar more efficiently. This is pretty obvious one. As a teacher, I didn’t use my calendar that often. As an administrator, there are so many meetings and other dates that are important that I have to make sure I’m aware of. 6. Read more posts from school administrator blogs. There are so many great school administrator bloggers out there who are sharing their experience online. I would much rather learn from their experience than to learn from my trial and error. I recently decided to browse through my Twitter followers, and I found some great blog posts. What I also came to realize is that too many school administrators are on Twitter, but they aren’t blogging, or if they are blogging, they are only sharing their vacation photos or their special family moments. This is nice, but I would encourage any school administrator reading this to start a blog, and then use that blog to share your experiences with other administrators. I’ve actually improved in this area, but there is still room for growth. My principal showed me how to handle a problem with grace. When I shared with her my mistake on the handbooks, she had every right to complain, but instead she took it in stride and didn’t make a big deal about it. Complaining doesn’t change anything. 8. Ask for help more often. I know I’m like a lot of new administrators who are trying to prove themselves by trying to do everything on their own. I have to come to the realization that I’m not a master of school administration yet, and that I’m going to have to swallow my pride every now and then to ask for help. 9. Read more books on leadership. Right now the admin team is reading a great book that I mentioned in my last post. It’s called Crucial Conversations by Patterson, Grenny, McMillan, and Switzler. Although I don’t have a lot of time to read anymore, I’m going to make use of my 40 minute commute to work to listen to more podcasts and audio books on leadership. I would love any suggestions from experienced school administrators as to which books to read. I can be sitting with my family around the dinner table, but mentally, I’m back at work thinking about tomorrow’s meeting or that parent who yelled at me over the phone. I find myself being scolded back into reality by my wife on a daily basis. This has to change. This coming year, I’m leaving work at work. Being able to rearrange priorities is an essential step in becoming a successful school administrator. I’m committed to fulfilling each of my resolutions for the coming year. What is your resolution for the coming year? How will 2013 be different from 2012 for you? What books on leadership do you recommend? 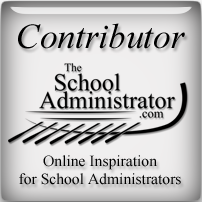 Do you have a blog about school administration that you recommend? After that last month of 2012, I feel like I’ve take a few steps back, but I’m committed to making 2013 a year of great growth as I journey toward school administration mastery. Thank you for the boost. I find myself feeling the same way many times. I am going to stay more connected to the Admin community by starting a blog to share / receive new ideas! Thanks for the comment. I read your post about your deciding not to stand still. I’m there with you. This year is going to be a year of moving forward. Thanks!